Most people welcome and celebrate Christmas even as they stress while rushing to complete holiday preparations. It’s the annual confluence of heightened pressure and activity (shopping, decorating, traveling, entertaining, etc.) meshed with warm thoughts of giving and family gatherings. It’s a common objective to actually capture that so-called Christmas spirit. And most people will celebrate Christmas whether or not they really buy into the whole Jesus Story, the literal reason for the season. Studies show (Lifeway Research, 2014) that despite increased secularization, 91% of Americans will celebrate Christmas. In fact, church attendance balloons on Christmas Eve to 47% vs. 18% on the typical weekend service. I guess if I was an atheist, I’d probably go along for the Christmas ride. May as well. Even if one has mostly paid lip-service to the Christmas story, or has been raised in ignorance – I have heard more than one child say that at Christmas-time “we celebrate the birth of Santa Claus” – it’s fair to challenge you to take another look at the Story and its component parts. The Christmas Story actually is a profound mosaic of uncanny occurrences that need to be considered or reconsidered. In fact, the stories around the birth of Jesus are filled with supernatural dreams and visions. So how do we deal with this? Did these really happen or are they all nice fairy tales? The entire story of Jesus’ birth is found in the first 2 chapters of both Matthew and Luke in the New Testament. In these chapters there are 8 uniquely fascinating dream and vision encounters involving 5 different persons/groups. An angel of the Lord appeared to him in a dream… (see Matthew 1:18-25). This informs him that it’s alright to marry Mary; that she is supernaturally pregnant and will bear a son who is to be named Jesus. Now when they (the wise men) had departed, an angel of the Lord appeared to him in a dream… (see Matthew 2:13-18). This is the warning for he and Mary to leave Bethlehem with the infant child and flee to Egypt to escape Herod’s search to destroy the child. 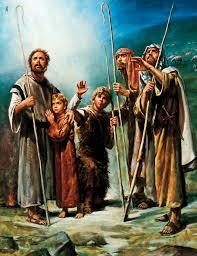 It is believed that Jesus was most likely 12-18 months old at this time. And being warned in a dream he withdrew to the district of Galilee (see Matthew 2:22-23). Joseph was concerned about returning to Bethlehem in the Judea district as now Archelaus, the worst of Herod’s sons, was in control there. This dream warning confirmed the fear and he went to Nazareth in the district of Galilee. Nazareth was the hometown of Mary. And being warned in a dream not to return to Herod, they departed to their own country by another way (see Matthew 2:1-12). Wise men (not necessarily only 3) originated from Persia or Media and had heard of the scriptural promise of a Messianic King in Judea. They encountered King Herod in Jerusalem whose own team determined that Bethlehem would be the source of the new Ruler. They proceeded but were warned to not return to Herod. And there appeared to him an angel of the Lord standing on the right side of the altar of incense. (see Luke 1:5-25). Zechariah, an older priest in the Temple, has an angelic encounter delivering news that he and his wife Elizabeth will have a child they are to name John. John the Baptist, a cousin of Jesus, is born 6 months before Jesus. Zechariah is stricken mute when he expresses disbelief at the notion. He recovers well. And he (the Angel Gabriel) came to her and said, “Hail, O favored one, the Lord is with you!” (see Luke 1:26-56). The young maiden in Nazareth is told that “the Holy Spirit will come upon you” and she will give birth to the Son of God. She acquiesces, and the rest is history. And an angel of the Lord appeared to them, and the glory of the Lord shone around them, and they were filled with fear. (see Luke 2:2-21). This is the heralding of the birth of Jesus to lowly shepherds who saw the child in the manger and spread the word of the birth of Christ the Lord. Yes, we are physical and spiritual beings who operate in a world created by a supernatural God who revealed and injected Himself (via Jesus) into our physical realm. Why can’t a supernatural all-powerful God impose thoughts, dreams and visions into the minds and lives of His creation? In fact, think about it: we are directed to engage with Him and His Spirit through the supernatural vehicle of prayer. Our very lives were designed for His engagement and influence. We should long for this relationship in our lives. Perhaps He has been signaling you through dreams and visions. So certainly, as the research shows, most of us will celebrate the Christmas holiday. Sad and unfortunate for those oblivious to God’s supernatural signals or unmoved to invest time to pursue understanding, validation, and support of the real, original, historical story. Are you a believer in God using dreams and visions to accomplish His purposes? From my perspective, absolutely. As a personal anecdotal example, I have been increasingly getting prophetic dreams concerning the church family I am part of. These have so far been 100% accurate about events years into the future. Thanks, Harry. Stay dialed in.